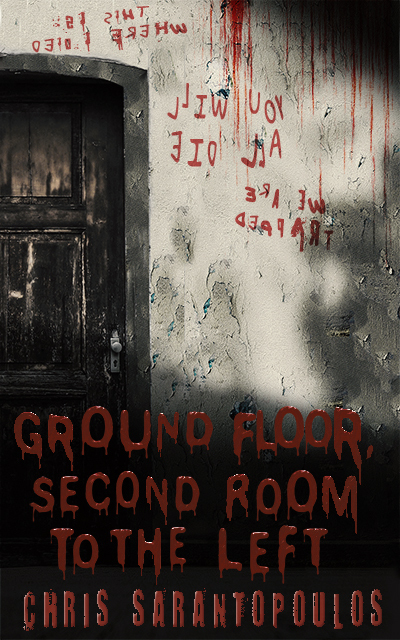 My fourth short story, Ground Floor, Second Room To The Left, is now available worldwide. This is a horror short piece that tells the story of Joe and Lucy, a married couple of scavengers, who enter a derelict building to steal copper pipes, only to realise they’re locked in. Things are getting heated up because Lucy is claustrophobic and can’t stand the idea of being trapped. But the real problem is the messages that begin to appear on the walls, floor, and ceiling. More importantly, what the messages tell Joe and Lucy they need to do to get out. Be careful where you venture. When Joe and Lucy, lovingly married, enter a derelict house to scavenge, the door locks behind them, trapping the couple in a half destroyed room. Lucy is claustrophobic and needs to get out. When Joe tries to break the lock, unnerving messages written in blood appear on the walls, asking the same thing from both. The price for freedom in steep, and unless they act fast, they will die trapped. Yep, you guessed it right: it’s a haunted house horror story and it already got a five-star review. You can also read the review on Wickedjr89’s book blog here and Inkandblotting’s review here. Featured there, you will also find a review of my previous short story, Wisps of Memory. Ground Floor, Second Room To The Left is available through Amazon as well as other retailers. And as a personal request, if you do read it, please consider taking five minutes of your time to review it. It will not only validate my efforts and my work (regardless of whether you like the story or not), but it will also add to the necessary attention my work needs. Your reviews matter, because they are the most important way a writer (and that’s true for indies even more) can build and strengthen his/her career. I hope you enjoy it. Happy reading, everyone! This entry was posted in My book characters, Published work, publishing and tagged cheap books to read, fiction, ground floor second room to the left, horror, horror short story, kindle, short story, writing. Bookmark the permalink. Thank you! It took me several tries before I got it right, but I believe it features the basic tropes of the genre.